Sat., June 9, 2018, 7:24 p.m.
KNOXVILLE, Tenn. – The spirit of former Tennessee coach Pat Summitt hovered over a Women’s Basketball Hall of Fame induction ceremony that included her longtime assistant coach and one of her greatest players. Former Lady Vols star Chamique Holdsclaw and former Tennessee assistant Mickie DeMoss both referenced Summitt in their induction speeches. Summitt died in June 2016 at the age of 64, five years after announcing she had early-onset dementia, Alzheimer’s type. Holdsclaw noted how Summitt told her players how her job was to raise strong independent women who would know how to fend for themselves after college. “When you get out in the real world and you have things that hit you, that knock you down, you realize that it was my grandmother, it was that Coach Summitt speech, it was Mickie putting her arm around me and telling me it was going to be OK, that help you propel forward,” Holdsclaw said. 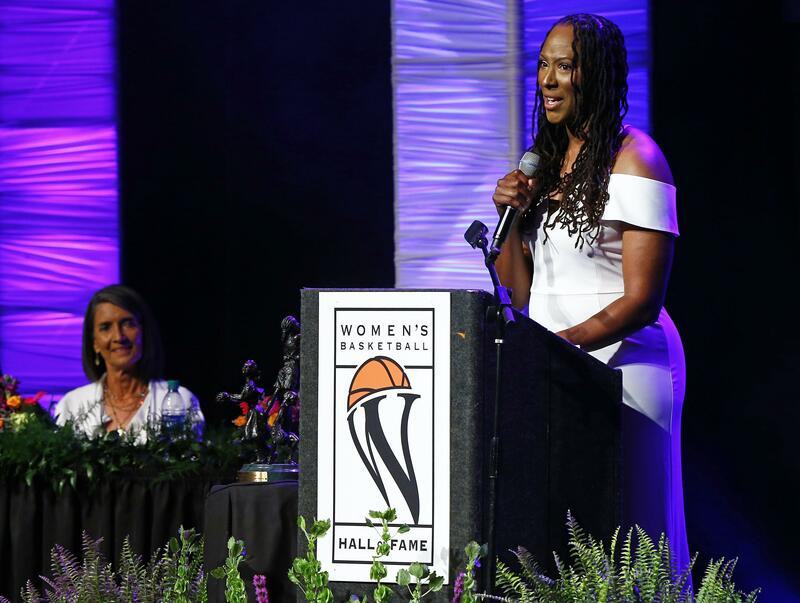 Holdsclaw and DeMoss were inducted along with former Colorado coach Ceal Barry, former New Jersey high school and college coach Rose Marie Battaglia, Connecticut assistant coach Chris Dailey and former players Katie Smith and Tina Thompson. DeMoss was an assistant on six of Summitt’s eight national championship teams, while Holdsclaw is the Southeastern Conference’s career scoring leader and Tennessee’s career rebounding leader. Tennessee won three straight titles from 1996-98 when Holdsclaw played for the Lady Vols while DeMoss was an assistant on Summitt’s staff. DeMoss and Dailey were the first people to be inducted for their achievements as assistant coaches in the Hall of Fame’s 20-year history . “I would… like to accept it on behalf of all the assistant coaches at every level who do their job every day, that love to teach, that want to impact young girls’ and women’s lives and don’t get the recognition I get but deserve also to be in the Hall of Fame,” Dailey said. Although DeMoss worked as a head coach at Florida (1979-83) and Kentucky (2003-07), she had her greatest success while working for Summitt at Tennessee. She also was an assistant at several other schools and on the Indiana Fever’s 2012 WNBA championship team. Dailey has never been a head coach, but she’s been a part of Connecticut’s staff throughout Geno Auriemma’s 33-year head coaching tenure. They’ve teamed up to help UConn win an NCAA record 11 national titles. Auriemma attended the induction ceremony and many of Dailey’s former Connecticut players came to Knoxville to show their support. That group included Seattle Storm teammates Sue Bird and Breanna Stewart, who arrived earlier in the weekend before leaving to prepare for their game Sunday. The trio of Holdsclaw, Thompson and Smith gave this induction class some star power. Thompson was the No. 1 pick in the inaugural WNBA draft and helped the Houston Comets win the WNBA’s first four league titles. She was a nine-time WNBA all-star and two-time Olympic gold medalist. Smith, a former Big Ten player of the year for Ohio State, won two WNBA titles with the Detroit Shock and earned three Olympic gold medals. Both Thompson and Smith have now transitioned to coaching. Smith coaches the WNBA’s New York Liberty. Thompson was hired as Virginia’s coach in April. Barry won 510 games in 26 seasons as a college head coach. Battaglia won over 700 games at the high school and junior-college level. The Hall of Fame also recognized members of the Women’s Professional Basketball League as “trailblazers of the game.” The WBL existed from 1978-81 and was the first professional women’s basketball league in the United States. About 100 former WBL players and coaches attended Saturday’s ceremony. Each one was brought onto the stage to receive a commemorative pin and pose for a group photo. Published: June 9, 2018, 7:24 p.m.